FA 4 Physical Science Question Papers 9th, 8th Class 2019 - Formative 4 PS Project works : FA 4 PS Question Papers, Formative 4/ FA 4 Physical Science Question Papers, PS Project Works, Physics Model Project Works Steps 8th to 10th Classes AP & TS, Download FA-IV Slip Test PS Question Papers, Formative Assessment4 Model Project Works 8th class,9th class,10th classes All Subjects AP and Telangana. Formative 4 Physical Science Question Papers prepared by our Teachers, SCERT CCE Model 6th, 7th, 8th, 9th Class Question Papers, CCE Physical Science Model Project Work Steps 10th, 9th, 8th, 7th 6th Classes AP & TS, Formative Assessment 4 PS Model Project Works VI to X Class AP and Telangana. 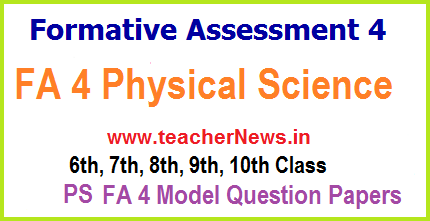 8th FA 4 Physical Science Question papers 9th Class FA 4 question paper, Physical Science 8th Class FA 4 question paper Telugu Medium and English Medium. AP Formative Assessment 4 and TS High School 2018-19, 6th to 10th Classes All Subjects FA 4 UP/ High Schools Telugu, Hindi, English, Maths, PS, Biology Subjects Question Papers, AP TS Primary Classes FA IV question Papers 2018-19 formative Assessment 4 - 6th Class Hindi, 7th Class Hindi, 8th Class Hindi, 9th Classes Telugu, English, Maths, Physical Science, Biology Subjects Question Papers with Hand writing and Printing UP/ High School Classes Formative Test 4 Conduct Written only 20 Marks in Upper Primary Classes Below Slip Test Prepared our Teachers. So, this Question Papers in Hand writing as per SSA Norms, Formative Assessment IV Question Papers and 6st to 9th Classes All Subjects FA 4 Question Papers Download. AP TS Upper Primary Classes FA IV question Papers 2018-19. FA 4 Physical Science Question Papers, Project Works for 8th, 9th Class. Download Formative 4 PS Question Papers, Model CCE Project Works VIII, IX Class For AP/ Telangana Students.